The Linenhall Arts Centre celebrates its 25th Birthday this year. It's one of my favourite places in the world and I've made the best of friends there. I scribbled this 'note and doggerel' piece as a sort of a birthday card. As far as I can recall, my Dad only ever knew one poem and he recited it often and at the oddest moments. It was, of course, 'The Lake Isle of Innisfree' by WB Yeats. I say ‘of course’ because we grew up along the Garavogue River which runs from Lough Gill down to the sea. It is there, ‘of course’, that Yeats’ famed island resides. A word for tourists. If you get in a bus or a car in Sligo, and ask them to take you to see the Lake Isle of Innisfree, it’s highly likely that they won’t. With the best intentions in the world, they will take you to a tiny tree-ridden blob off the rocky shore close to Dromahair and, yes, although it is called ‘Innisfree’, it is not Yeats’ Innisfree. That honour, in my view, goes to the Island known locally as ‘Church Island’. No bus can take you there but, if you can ever find yourself a handy boatman, you should go. Just go. We spent much of our childhood coming and going from Yeats’ Innisfree. Not thinking of it as a place from a poem but rather as a place of undiluted magic and, yes, a place of peace. We fished along the Rookeries just off its shore and we sheltered under the trees and warmed ourselves with smoke formed tea, as the rain drew huge ever-expanding circles on the flat calm water. We knew what it was to really have Innisfree. What, you may ask, does all this have to do with the business in hand? The Linenhall's twenty fifth Birthday Celebrations? It’s simple, really. After a childhood happily spent in the environs of the original, I was blessed enough to find a second Innisfree. And it is here at the Linenhall. I could extol the virtues, sing the praises. I could do all that. But the best that I can do is to simply tell you this once more. 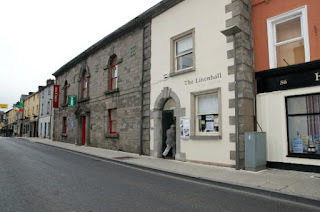 That The Linenhall is my Innisfree. So, with apologies to WB, wherever his bones may lie, I have tampered with his poem to turn it into a sort of twenty-fifth birthday card to my friends who keep the magic alive. And Maura, Orla, Oisin, Ian and all the friends I’ve made. And live in the Art that is their stock in trade. And evenings full with the chance of better things. while I sit at my desktop, or on computers grey. I hear it in that warm art’s core. Happy Birthday, Linenhall, and thanks. I’ve written about place before and at length so I won’t labour the point; it only underlines my perversity. If I had a sense of the spiritual I think I might do better with place. I’m reminded of two things here which illustrates how my mind works, i.e. perversely. Here were are having a nice wee chat about childhood haunts and I immediately jump to the film version of Birdy and a monologue by Billy Connolly. The Connolly is perverse because I’d bet money on the fact Billy does have a sense of place—he certainly goes to enough—but here he’s talking about not being a go-for-walks kind of guy: “I'm not a great "go-for-walk" person, but he was doing whatever people going for walks do ... Go for a walk, walking. Oh, a tree, I'm glad I came. Oh, there's a bird, what a walk this is turning out to be!” The scene in Birdy is where a girl removes her top for him in a parked car, “What’s the big deal, they’re just overgrown mammary glands! […] They're just like on a cow, but in a more stupid place.” (I think I might be mixing up a conversation with Al here but you get the idea.) The common ground is an inability to see the magic/beauty in something others obviously do. This is a fairly new phenomenon with me. As a kid I was always outside and there’ve been numerous places over the years I’ve gravitated to and considered mine. That was the gist of my poem ‘The Curse of the Summer Saturday’: what were these interlopers doing in my place? Somewhere along the line I lost that. Maybe it was then I finally grew up. I know when I first typed ‘poetry’ into a search engine and found the wonderful world online I felt like I’d come home. And it was my sense of place—albeit an abstract one—that’d been triggered. I no longer feel that. The magic’s gone. I am glad you’ve found a new Innisfree. And I’m a little jealous. When we lived in the Gorbals we were within walking distance of the Citizen’s Theatre. That’s when I wrote Vladimir and Estragon are Dead and I always planned to go along and see if I could persuade someone to have a crack at it but I never did and we only ever went twice (Beckett’s Endgame and a night of Pinter shorts). The same with the Òran Mór in the West End when they were putting on their lunchtime plays (A Play, A Pie and a Pint) but, again, I allowed my awkwardness and fear of embarrassment to get the better of me. And that was me when I wasn’t having panic attacks.